An aging, cracking roof puts your home in serious danger of harmful leaks, mold, and structural problems. Your home is too big an investment to leave open to these potentially dangerous elements. With one call to the expert Houston roofers at Live Oak Construction, you can be safe and sound under a waterproofed roof in short amount of time. 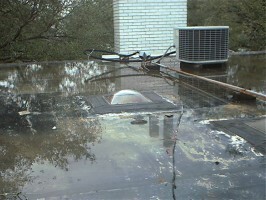 Our Houston residential roofing experts have more than 24 years of experience working to seal and repair leaky roofs. We recognize the aspects of roofs that are prone to cracking, and quickly search out gaps, holes and fissures to be filled. Using the latest in waterproofing technology, we can restore your roof to its original health and extend its life for several years. Don’t wait until you see wet spots in your walls and water leaking from your ceiling to call for a roof repair Houston! When you have a Houston residential roofing problem, your first step should be to contact Live Oak. Contact the Houston roof repair professionals at Live Oak Construction for a free in-home consultation on the state of your roof.